The term extrusion reprocessing refers to the minimizing of the scrap generation and recapturing of the material value in most of the operations. In almost all types of extrusion processes, it is a common practice to grind up the scrap materials by using granulator or allied suitable equipment. With the usage of this equipment, such granules can be made that are fed back in the extruder. In the compounding operations, initial material is granulated & then it is fed back in the extruder at a pre-decided level for the augmentation of raw materials, while the reduction of scrap to be disposed. There is another compounding option, which is to select the products that are not as per the user's specifications of color, or appearance. Then grind-up these products and add black concentrate to them. Afterwards, reextrude (by Extrusion Reprocessing) it into a black product. A number of colors may be added with the black concentrate to the extruder for the production of a black product that conforms to every specification of the customers. The mixing is done in a ribbon blender, tumble blender, continuous mixer, etc, for the development of an even mixture which is extruded in black product. 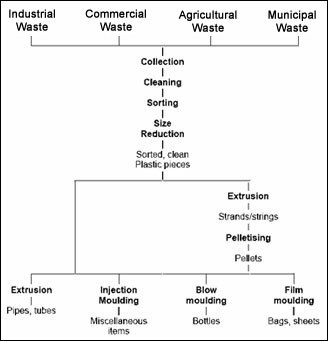 While the extrusion process is brought to equilibrium, the reprocessed or recycled material may enter from film operations or edge trim in sheet. This material may flash from off-spec products, blow molding, and the start-up material. The scrap is either generated as post-industrial waste, which is created by plastic companies, or as post-consumer waste, which is created by consumer. If the scrap created in extrusion process is used properly, it can be a cost-effective source of raw material. Consequently, the overall cost of extruded product is reduced. The grounded laminate is fed to a compounding extruder. In the extruder, melting and homogenization of the product takes place. Hence, useful plastic is formed which may be sold as pellets or further extruded in another congenial application. In case the components in the laminate are not compatible, then for the required result the material is incorporated in a center layer in a co-extruded structure. An alternative method is to try and sell the product as it is.